Traditional ultrasonic spectroscopy methods (narrow pulse, broadband ultrasonics) have often fallen short in application due to limitations on bandwidth and input energy. A system for ultrasonic spectroscopy that uses a swept-frequency input signal has been developed. The signal can cover a wide, user definable, range of frequencies resulting in a spectrum with a robust signal-to-noise ratio. The spectrum can also be designed to provide uniform input energy over the selected range of frequencies. The new ultrasonic spectroscopy technique has been used to quantitatively measure such diverse properties as porosity content and thickness loss in corrosion applications. It has also been successful in identifying disbonds in multiple layer structures. An overview of the technology along with application examples will be presented. The vast majority of Ultrasonic testing for NDT purposes is carried out using either Time /Amplitude analysis, for example to find and locate cracks in welds or railway lines, or amplitude only analysis, for example in through-transmission inspection of composite structures. There are a number of potential applications where although “In principle” Ultrasonics might appear an appropriate technique, in practice the method is not feasible, either because the received signals are too complex for analysis, or because unwanted effects, such as coupling variation, cause bigger changes to the signal we are tying to analyse than the change we are trying to identify. Changes in material response to ultrasound of different frequencies – Typically this is very pronounced when the sound wavelength is of similar magnitude to the size of features such as porosity or surface pitting. ‘Conventional’ Ultrasonic Spectroscopy  uses a wide bandwidth, highly damped probe, excited with a short pulse. The energy spectrum of such probes includes a range of frequencies, However we will typically not get a very wide frequency range (maybe 2:1 at best) from any given probe, and the amount of energy at any given frequency is typically quite low – It is difficult to get an acceptable signal to noise ratio except in fairly simple applications. One approach is to drive the probe with a continuous signal, swept over a preset range. An example of this type of instrument is the Fokker Bondtester, which performs extremely well in certain applications, such as identifying disbonds in honeycomb or laminated structures, however these instruments have a relatively low inspection speed, due to the sweep time. Ultraspec™: The Ultraspec™ system [2,3] , developed by the Southern Research Institute in Birmingham Alabama, uses a digitised ‘Chirp’ signal to drive a standard dual element probe with an appropriate range of frequencies. This provides a high energy, even with a broadband signal, and gives the ability to tune the range and centre frequency to suit the application. After amplification the received signal is digitised and processed using a Double Fourier transform technique to identify resonances and resonance spacing. Sonatest are working with SRI to commercialise this technique. When analysing the properties of a material in the frequency domain it is very desirable to isolate the properties of the material under investigation from those of the instrumentation, Ultrasonic transducers are not, in general designed for broad frequency response, Those that are tend to be of relatively low efficiency. With UltraSpec we normalize the frequency response by adjusting the amplitude envelope of the transmit waveform over the cycle as shown in Figure 2. Thus we can achieve a ‘square-wave’ response in the frequency domain with much greater energy and frequency range than with a conventional pulse drive. The received signal is normally very complex (at least when viewed in the time domain). After amplification to a suitable level, and digitisation a Fast Fourier transform (Figure 4) is produced, which identifies the frequency components of the received waveform. For some applications, such as identifying frequency dependant attenuation of the signals, this is sufficient, for other applications, such as complex structures having multiple resonances; a second Fourier transform is performed (Figure 5) . This identifies the spacing of the resonances, which will often give much better clarity of analysis. For thin materials, at typical frequencies so far used with Ultraspec, the Frequency range will not provide multiple resonances, so the Spacing transform cannot be used. Currently Ultraspec is implemented with two PCI cards on a Desktop or ‘luggable’ PC. The original version of the Ultraspec software was DOS-based, but this has now been transferred to a Microsoft windows Platform. Ultraspec has also been implemented as a plug-in for the QinetiQ Andscan software, and has been interfaced to the Boeing MAUS scanner, While Ultraspec is typically slower than pulse echo Ultrasonics, it is very much faster than swept frequency techniques, so C-scanning is a realistic option. Figure 7 Sonatest MS340 Flaw Detector. 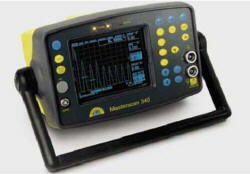 It is recognised that the bulky nature of a PC implementation, as well as the requirement for AC power, is less than ideal for many techniques where UltraSpec would be useful, so it is currently intended to implement the Ultraspec technique in a portable package similar to the current Sonatest range of Ultrasonic Flaw Detectors. Many composite structures consist of two or more layers, bonded together with a suitable adhesive. These can be difficult to inspect ultrasonically from one side, since typically the majority of the sound energy is reflected, making it be difficult to distinguish between the bonded and disbanded condition, let alone usefully distinguish any intermediate state Resonance spectroscopy allows these conditions to be more clearly distinguished. If the layers are well bonded they will resonate as a system, at a low base frequency. If poorly bonded they will resonate separately, and lower layers may not resonate at all, because no energy is transferred to them. When looking at the ultrasonic spectrum the presence or relative strength of the different oscillation modes allows interpretation of the presence, and effectiveness of energy transfer through, the bond. The energy transfer efficiency can, in some cases, be correlated with the relative strength of the bond. In the example shown in Figure 7 a thin upper layer is bonded to a relatively thick substrate. This is difficult to quantify using Conventional ultrasound unless the application is suited to a ‘pulse train decay’ type of measurement. This can work very well, in situations where the materials are relatively well matched and non-attenuative, such as metals, but is typically not practical with composites, in any case it is very dependant on the degree of coupling between the probe and the top layer. This much less affects the resonance method, because here you are comparing the strength of two internal resonances, both of which are likely to be affected equally by coupling variations. In the first pair of spectra the assembly is well bonded and effectively resonates as a single layer, Because it is relatively thick there are many resonances within the frequency range examined, and the second FFT shows a clear base frequency of around 80 kHz. In the second pair of spectra the assembly is partially bonded and resonances from the top layer predominate, although weak resonances from the combined assembly are present. This is clearly shown in the second FFT, where the 80 kHz peak characteristic of the bonded assembly is present, but weak. In the third pair of spectra there is complete disbonding and only resonances from the top layer are present. The 80 kHz peak representing the base resonance of the bonded material is absent from the second FFT. Preliminary results have indicated that there is a reasonable correlation between the strength of the second Spectrum peak and the bond quality, and the Ultraspec technique holds promise for the evaluation of ‘kissing bonds’ [4,5]. Mechanical variations such as porosity and surface roughness interact with ultrasonic waves causing dispersion and a reduction in the energy reflected. In the case of a resonant system the strength of the resonance will be significantly reduced. This effect is very frequency dependant. In the case of porosity for example, low frequencies will pass through unaffected. High frequencies may be blocked completely. It is not unusual in through transmission ultrasonics to find materials that act as a ‘low pass filter’. At some intermediate frequency or combination of frequencies it is possible to correlate the signal amplitude to the degree of porosity. A previous paper by the author discussed this in the case of air-coupled ultrasonics. With Ultraspec It is easy to see where this transition frequency occurs, (In fact one of the original purposes of UltraSpec was as a tool for assessing optimum frequencies for ‘conventional’ UT). Because UltraSpec allows a direct comparison between responses at different frequencies, it can easily distinguish the change in response with frequency from other effects, such as a variation in coupling which would cause a (relatively) frequency independent response change. Figure 12 Effect of surface condition on Spectrum. Surface Corrosion gives very similar results. At low frequencies a heavily corroded surface will give a fairly strong reflection, but at higher frequencies, because of the interaction between the short-wavelength sound and the surface irregularities, a very weak reflection will be obtained. This effect will be familiar to anyone who has carried out thickness measurements on corroded surfaces. Because Ultraspec is capable of accurately measuring this fall off in frequency it can be used to measure the surface roughness of hidden surfaces, Most particularly, this can be used for early detection of back surface corrosions, for example due to a breakdown in protective coatings. Often this can be detected at a point where no significant reduction in thickness has occurred, giving very early awareness of potential problems, and allowing repairs to be scheduled. In some cases the material can be allowed to deteriorate further (and be monitored) without risk, in other cases an early repair can be limited to replacement of protective coatings. Q Responses from UltraSpec can be fairly complex, and it can be difficult to understand what you are looking at. QinetiQ, supported by Sonatest and the UK DTI, have produced a mathematical model, Implemented in an MS-Excel spreadsheet , which allows simulation of a three layer (metal/adhesive/metal) adhesively bonded metallic structure with adhesive bonds. Dis-bonding, or poor bonding between layers can be simulated by changing interface properties. There is no ‘definitive’ relevant model of a poorly bonded structure, but this approach appears to give a useful similarity to experimental results. Ultimately it might be useful to further develop this model to try and simulate non-metallic structures, but this would be much more complex. Figure 14 Ultraspec operators in Space Shuttle cargo bay. The Ultraspec system has proven very effective for a limited number of specialised applications. After a few years of semi-commercialisation it has a ‘small but serious’ user list including NASA, Boeing, Lockheed, the US Navy and QinetiQ, It can solve some problems much more effectively than other available technologies. However many applications are limited by the relatively bulky packaging and user expertise requirements of the current implementation. The current priority is to reduce the size and cost, and improve the usability, so that they become comparable to users expectations, and to other ultrasonic technologies. Fitting D W and Adler L, “ Ultrasonic Spectral Analysis for Nondestructive Evaluation,” Plenum Press, New York, 1981. Tucker, James R.: Ultrasonic Spectroscopy for Corrosion Detection and Multiple Layer Bond Inspection. Proceedings of the First Joint DoD/FAA/NASA Conference on Aging Aircraft, vol. II, 1998, pp. 1537–1550. Chambers, J.K.; and Tucker, J.R.: Bondline Analysis Using Swept-Frequency Ultrasonic Spectroscopy. INSIGHT vol. 41, no. 3, 1999, pp. 151–155. Smith R A, Weise V L And Dalton R P, "Potential Advanced Ultrasonic Methods for Detection of Weak Adhesion", Published in the Proceedings of NDT2003, 42nd Annual Conference of the British Institute of NDT, 2003.